The image is from the upper side of the stage. Showers of electronic tones chirp on a bluish scene while that quietly a line of bass spreads a pattern of furtive rhythm. Synth pads come down, as the cameras follow the graceful movements of Detlev Keller and Mario Schönwälder whilst quietly, Bas Broekhuis activates the electronic trunks which drum the delicate rhythm of "The Streets of Culemborg". The cameras shots are very beautiful. Sharp and keen, they are professional camera captures which show us all the delicacy of Broekhuis whereas that Schönwälder weaves his vampiric odes on the delicate e-piano chords that Detlev Keller draws so softly at the end of his disentangled fingers. Those who are familiar with the musical structures of BKS' Repelen phases will be on a well-known ground with this long minimalist track which is embroidered around morphic sweetnesses on a rhythm a bit jerky and the musical fragrances of the peoples of the sands. Don't fool yourself! Unless being Jean Michel Jarre and being such a salesman who gets paid for his big orgiastic events straight from the public money, a live performance of EM is like attending to a mass in a church full of blind souls. Without special effects, big screens with abstracts paintings, laser beams or fireworks, only the music is left to amaze the audience. 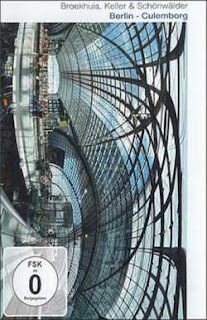 “Berlin-Culemburg” is the 3rd DVD project from the Manikin label, the home of Mario Schönwälder. The others being In Repelen (2010) and Analog Overdose - The Road Movie from Fanger & Schönwälder in 2012. And as in each of these two DVD, “Berlin-Culemburg” presents a very nice intimist sound feast which is undoubtedly going to please to those who adore the very particular Berliner style of Broekhuis, Keller & Schönwälder. Taken from concerts given in the cities of Culemborg (Netherlands) as well as in Berlin and Bad Sulza in 2008, “Berlin-Culemburg” presents a sober film approach where we see very well the trio in action. There are no secrets. We see everything, better even than on several others DVD. And the neophyte, such as I, has finally a much demystified global vision of the electronic art and, especially, of its components as well as the secrets of their tones and musicalities. At this level, “Berlin-Culemburg” is a real success. The music? Ah... It is so beautiful. It even listens to better that it looks! After "The Streets of Culemborg", we dive directly into the atmospheres of the Berlin concert where the image is a little more coated with a granular absorbent cotton. But we see in there very well. It only gives a strange effect of being behind a curtain of silk. "Berlin Bei Nacht" opens the concert given at Ballhaus Naunynstrasse in Berlin on April 4th, 2008. This time, the camera shows a complete different stage setting where we see the trio from front. Bas Broekhuis, being in center, lets us have a good eye over the accessories of his impressive electronic drum kit. And this portion of the DVD plunges us into the most beautiful musical passages of “Berlin-Culemburg” with a true incursion into the minimalist spirals of the Berlin School style, as much as retro than contemporary. A movement of sequence rises and comes down on the jingles of cymbals of which the elytrons of steel don't succeed to dissipate a dense mellotron mist which misleads its choirs while wrapping the track of a silky allegorical mood. And quietly "Berlin Bei Nacht" kisses the stoical pulsations of a delicate robotics techno which loses its measure in synth solos which coo beneath the strong percussions of Broekhuis. One would believe here to hear a contemporary version of Klaus Schulze and Harald Grosskopf on Body Love. "Kreuzberg" presents a more audacious structure of rhythm in an introduction which explodes of metallic tones. A superb stroboscopic movement sneaks in behind this industrial din and draws the bases of a minimalist rhythm which pours its heavy jerky jolts into the percussions drummed on a curious Dynacord guitar on which Bas Broekhuis bangs on the stick to extirpate tones a little bit funky. The sound envelope is of delights with great solos of smooth synths which squeak of their breezes of dismays nearby chthonian choruses. This is contemporary Berlin School at its best. The first part of "Berlin Im Frühling" favors more seraphic choirs which hum on a line of rhythm more funky/groove than morphic minimalist. It's a kind of fusion between electro-pop music and IDM with a distant Berliner essence. Camera shots, we don't forget here that it's a DVD of a live performance, are clearer and more precise. They dive into the intimacy of the relation between the musicians and their instruments and it's rather interesting to watch Broekhuis fussing on his mini wall of sequences. The second half offers a more electronic rhythm of a New Berlin School kind. Although I savoured at full ears "Berlin Bei Nacht" and "Kreuzberg", the cornerstone of this DVD, set apart from the camera shots, is the wonderful "Do You Remember the King?" And the King is not Elvis! Recorded during the Culemborg concert, it's a track as much beautiful as mesmerizing which slightly brushes the delicious aromas of Klaus Schulze's Dreams. So there are no needs to describe it, only the feelings which burst out of it. And they are strong as much as it's so beautifully writing. Wonderful! We slip out of time. Performed during a concert at Toskama Therme in Bad Sulza on August 16th 2008, "Mysteries of a Full Moon Night" is a more or less ambiospherical and experimental track with a structure of sneaky rhythm where the ambiences of Repelen float like scents of threat. Some very beautiful EM, from whom the contemporary tones don't erase all of the soft memories of an analog EM, and nice camera shots which lift the veil on the secrets of the electronic art from the trio, “Berlin-Culemburg” has everything to satisfy the fans of EM and particularly those who like the music of Broekhuis, Keller & Schönwälder. And there I think in particular of the fans whom the distance prevents too often from attending the numerous concerts that the trio gives mainly in Europe, because BKS invites themselves in your living room in PAL and NTSC as well as in region free. A delicate thought on behalf of three artists who possess all the magnetism of their music.